I shook my head. “Not all outs are created equally” I said. And nobody got bigger outs in the 1999 ALCS than Mendoza. The Yankees were the defending World Champs in 1999 and looked like they were primed for a repeat. The Western Division Champion Texas Rangers provided little resistance in a 3 game Division Series sweep. Their biggest challenge would come from the Red Sox, who erased a 2-0 hole in their Division Series fight with the Cleveland Indians and entered the ALCS with a red hot offense and an unstoppable force pitching every 4 days. Pedro Martinez put together a historically great 1999, only to be matched the next year, as the Red Sox ace put up mind boggling pitching numbers in the middle of the steroid era. Pedro came out of the bullpen to throw 6 no hit innings to clinch the Division Series and would not be available in the ALCS until Game 3. If the Red Sox had a hope in the ALCS against their rivals, they needed to steal a game in the Bronx in either Games 1 or 2 and hand the ball to Pedro in Game 3 and be up 2-1. In Game 1, the Red Sox jumped on El Duque to put together an early 3-0 with images of a Game 1 win dancing in Boston fans’ heads. But the Yankees chipped away at the lead, benefited from a bad call at second and won on a walk off homer by Bernie Williams. Game 2 became a critical game for both clubs. The Yankees could not go to Boston tied 1-1 knowing Pedro was on the mound. And the Red Sox could not be down 0-2 and be in position to lose the series in Boston even with a Pedro win. The other Martinez, Pedro’s older brother Ramon, the former Dodgers ace, started for Boston. David Cone took the mound for the Yankees. Jason Varitek tripled off the wall in the second inning but was stranded on third. In fact in each of the first four innings, the Red Sox stranded runners in scoring position while the game remained scoreless. The Yankees took a 1-0 lead in the fourth on a Tino Martinez homer but the Red Sox jumped ahead 2-1 on a Nomar Garciaparra 2 run shot. In the 7th, the Yankees rallied and made the score 3-2. Now it was a race to get to Rivera and close out the game. In the top of the 8th, Troy O’Leary narrowly missed tying the game with a homer, settling for a lead off triple. After a hit by pitch, Varitek bunted O’Leary to third and pinch runner Damon Buford to second. Now a single would give the Red Sox the lead. After an intentional walk, Joe Torre handed the ball to Ramiro Mendoza with the bases loaded and one out in a one run game. Mendoza was Joe Torre’s jack of all trades. The 27 year old from Panama would start, close and be a set up man and middle reliever. 1999 was not as strong a year for him as 1998, but Torre never hesitated in throwing him into games with a constantly changing role. Now he was essentially being asked to save the game. First up was pinch hitter Butch Huskey, an outfielder who slugged 22 homers between Seattle and Boston in 1999. Mendoza struck him out, ending any possibility for the Red Sox to tie the game on an out. Next up was Jose Offerman, the Red Sox second baseman whose up and down season featured a trip to the All Star Game and a benching. His bat was heating up and he had already collected two hits in Game 2. But Mendoza got him to fly out and end the threat. The Red Sox would later get a pair of hits off of Mariano Rivera in the 9th but once again fall short. With Mendoza’s two outs in the 8th, the Red Sox bid to tie the game would not come through and the Yankees did indeed take the 2-0 lead. Pedro Martinez won a Game 3 blow out but the Yankees took Game 4 in a contest much tighter than the 9-2 final would suggest. In Game 5, the Red Sox fell behind 4-0. But in the 8th, they started to rally. Varitek homered and the Red Sox loaded the bases with one out. Again, Torre turned to Mendoza with the go ahead run at the plate. He struck out Scott Hatteberg and got Trot Nixon to pop up. When Jorge Posada padded the lead to 6-1 with a 2 run homer, the pennant was all but won. Torre let Mendoza close out the series instead of turning to Mariano Rivera. The Red Sox lost and the Yankees would avoid a second Pedro start. And I slumped at the Indigo Bar. I was convinced I would never see the Red Sox win an ALCS, certainly not against the Yankees. Not all outs are created equally. Yes, Ramiro Mendoza only got 7 outs. But think about 4 of them and how critical they were. Had the Red Sox rallied in Game 2, they would have taken control of the series. Even a rally in Game 5 could have set up a Game 6 “Avoid Pedro at all cost” showdown. Instead he got the outs and eventually the save. While he never got the MVP I felt he deserved, he did become the Unsung Post Season Hero of October 14. The Yankees love to bring stars to the Bronx, but do you know what they love more? As I wrote before, the Yankees are underrated in their gooey sentimentality and nostalgia. But I wondered about the Steinbrenner era and how many former Yankees came back for a second tour of duty. George kept triumphantly bringing back old heroes. Hank and Hal seem ready to continue the tradition. And I created a 25 man roster of Yankee heroes who had an encore… often times an anticlimactic one. As always, my 25 man roster will have a starter at each position, 5 starting pitchers, 5 relievers, 2 reserve infielders, 2 reserve outfielders, a backup catcher and a 25th player. First Tour (1992-1995) Became an All Star and Silver Slugger Award winner when he crushed 26 homers, batted .305 and posted a .923 OPS in 1993. He was a key part of the 1994 team whose Division Title hopes were dashed by the strike. In the 1995 Division Series he homered, batted .313 and slugged .500. Super popular, he was passed over for Joe Girardi and headed to Boston. 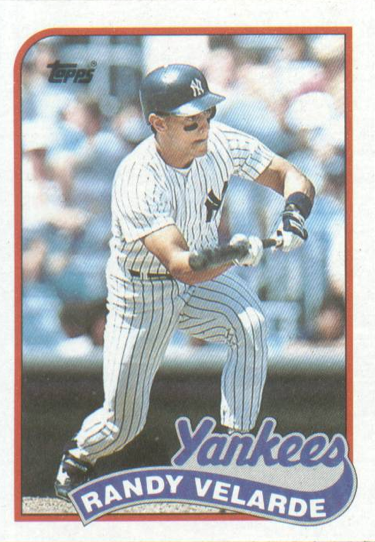 Second Tour (1997) For the August stretch run, the Yankees traded Tony Armas Jr. to the Red Sox to bring Stanley back. 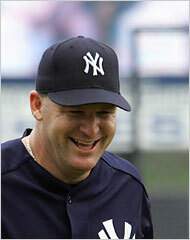 He played 28 games with the 1997 Yankees, the only team between 1996 and 2000 to NOT win the World Series! What rotten luck. 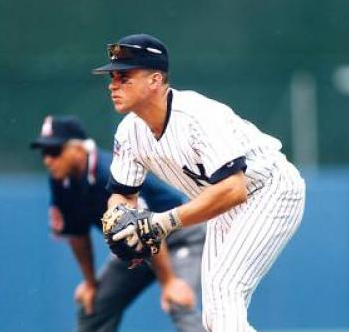 First Tour (1996-2001) Took over for Don Mattingly and became one of the best big game players on the Yankees. The AL MVP runner up in 1997, he slugged a game turning grand slam in Game 1 of the 1998 World Series and homered off of Tom Glavine in the Yankees come from behind Game 3 victory in the 1999 World Series. But most famously launched a 2 out 2 run Game Tying homer in Game 4 of the 2001 World Series. When the Yankees let him walk to St. Louis to make room for Jason Giambi, many Yankee fans were disgusted. Second Tour (2005) In the wake of the 2004 ALCS collapse and Giambi being linked to steroids, the Yankees needed some positive old time Yankee feeling in the clubhouse. 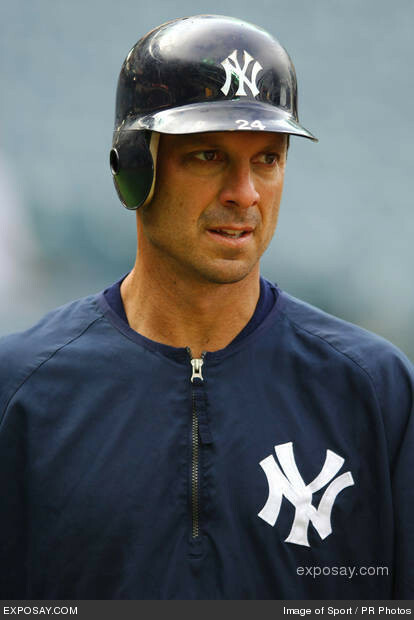 Fans cheered the return of Tino Martinez. He had some pop left in his bat but he was no longer the elite first baseman. He was hitless in the 2005 Division Series and retired. First Tour (1996-1999) Picked up on waivers for the stretch run, Sojo contributed to the 1996 World Series title, collecting 3 hits in 5 at bats. He was a fan favorite, batting .307 as a part time player in 1997. He looked like a regular guy, played every position and embodied the selflessness image of the Joe Torre Yankees. Second Tour (2000-2001) Sojo went to the Pirates for the start of the 2000 season but was rescued by his old team when the Yankees dealt for him in the stretch run. With Chuck Knoblauch’s fielding woes regulating him to DH, Sojo started Game 5 of the 2000 World Series and with 2 outs in the top of the 9th, drove in the winning run. He also played in the 2001 World Series and came out of retirement to play in 3 games in 2003. First Tour (1987-1995) Velarde played through some of the lean years in the Bronx. He played all over the infield and wasn’t flashy but steady. In the 1995 Division Series, he drove in the 11th iining go ahead run in the decisive Game 5 off of Randy Johnson. Alas, Edgar Martinez drove in the winning runs, negating Velarde’s heroism. He left the team for the Angels in the off season. 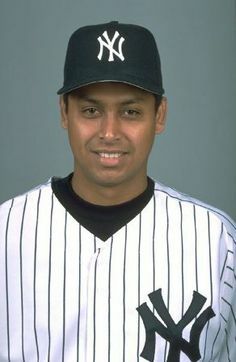 Second Tour (2001) The Yankees traded for Velarde in August in a deal with Texas. He finally got to play in the World Series. He went 1-9 in the post season and played 2002 with the “Moneyball” Oakland A’s. He has become a key witness in the Bonds trial as Velarde was evidently a juicer. That would explain his 100 career homers over 16 seasons. First Tour (1992) In the last truly rotten year in Yankee history, Hayes gave New York some stability and pop at third base and played hard for an also ran team and in front of small crowds. Second Tour (1996-1997) Even though the Yankees had future Hall of Famer Wade Boggs at third, they dealt for Charlie Hayes for the 1996 stretch run. In the World Series, he started 3 games and caught the final out of the Game 6 clincher. 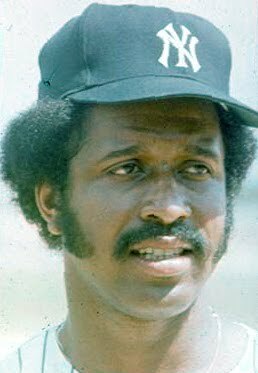 First Tour (1976) The left handed slugger with a huge afro (but reduced in the Bronx) was a favorite of manager Billy Martin. He slugged 17 homers and helped the Yankees reach the World Series for the first time since 1964. But the arrival of Reggie Jackson made his spot on the roster unnecessary and was dealt to the White Sox for Bucky Dent during spring training 1977. 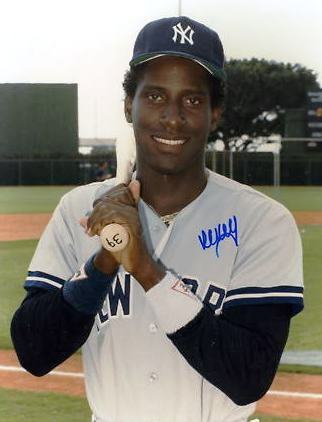 Second Tour (1979-1984) Gamble returned to the Bronx in a trade that sent Mickey Rivers to Texas. Reunited with Martin, he batted .358 with a 1.065 OPS in 1979. He would have won the batting title if he had enough at bats. He powered the Yankees past the Brewers in the Divisional Playoff Series of 1981. First Tour (1987-1992) In the Yankees last horrible stretch, Kelly was the hope of the future. He seemed like he was going to be a multiple tool star. He had power. He had speed. He had defense. And he represented the Yankees at the All Star Game. His numbers were good, but not great. But what else did the Yankees have? Suddenly they dealt him to the Reds for Paul O’Neill. And we all know how THAT ended up. 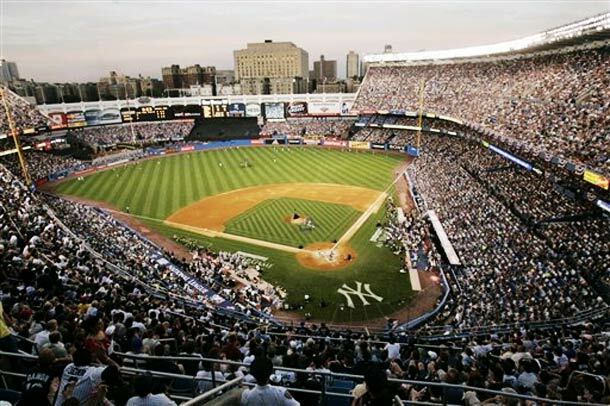 Second Tour (2000) The two time defending World Champion Yankees brought back their one time star in 2000. He played 10 games in April but that was it. He was done for the year and never played in the bigs again. First Tour (1990-1996) The King toiled on the wretched early 1990s Yankees squads to become an outspoken and unusually clutch post season hitter. He never played more than 95 games in a season and always was a platoon or part time player, he smashed two of the most dramatic homers in recent Yankee history. His 2 run 14th inning walk off shot ended Game 2 of the 1995 Division Series against Seattle. But it was his 3 run shot off of Mark Wohlers in Game 4 that turned the tide of the 1996 World Series for the Yankees. The Braves never led again in the series. 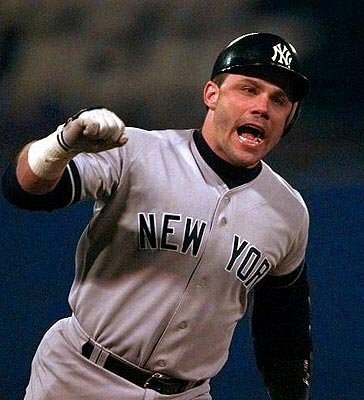 Second Tour (1999-2000) After stops in Anaheim, Boston, Texas and San Diego (where he continued to club post season homers) Leyritz returned to the Bronx for the 1999 stretch run. Surprise! He picked up another World Series homer in Game 4 against the Braves. He was traded to the Dodgers the next year and retired. He was mainly a catcher but that position was plentiful in creating this roster. First Tour (1965-1966, 1969-1974) When Murcer was first called up from the minor leagues, the Yankees were still the defending AL Champs and on a run stretching back to the late 1940s. His teammates were Whitey Ford, Elston Howard, Tony Kubek, Bobby Richardson, Roger Maris and another slugger from Oklahoma named Mickey Mantle. By 1969, Murcer was the new face of the franchise and put up All Star numbers toiling for some truly bad teams. He had the AL’s highest on base percentage in 1971 (and had the best OPS and OPS+, but nobody knew that.) The next year he had the most total bases in the league. But after 1974 he was sent packing to San Francisco for Bobby Bonds, a trade that helped neither player. Second Tour (1979-1983) Murcer returned to the Yankees, missing the two World Championship seasons of 1977 and 1978. He famously delivered the eulogy for Thurman Munson and then hit a 3 run homer and 2 run walk off single to lead the Yankees that night against the Orioles. 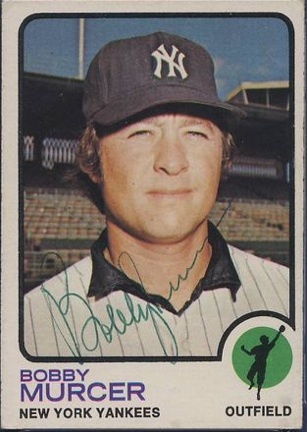 A connection to past Yankee glory, he finally played in a World Series when the Yankees lost to the Dodgers in 1981. He retired in 1983 and became an announcer until he passed away in July of 2008. He was mourned as one of the most beloved figures in Yankee history. 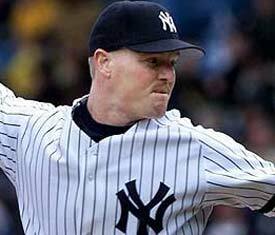 First Tour (1999-2003) The fading former Red Sox ace magically became great again with back to back Cy Young seasons in Toronto and found himself in the Bronx. Yankee fans were slow to embrace him, especially after a pair of subpar seasons in 1999 and 2000. But he helped win a pair of World Series, getting the victory in 1999 clincher and firing a bat at Piazza during his Game 2 win in 2000. He won another Cy Young Award in 2001 and won a critical game against the Diamondbacks in the World Series and pitched well in the Game 7 finale. 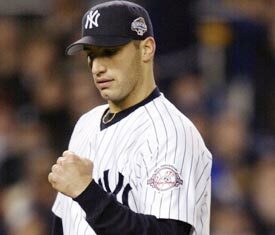 He won his 300th game as a Yankee and walked off the mound in Game 4 of the 2003 World Series, presumably the last game of his career. Second Tour (2007) Surprise! He stuck around and went to Houston, picking up yet another Cy Young Award and pitched in another World Series. Then, with the Yankees in desperate need for pitching in 2007, made a mid game announcement from the Steinbrenner box that he was returning with the assumption he still had his Cy Young stuff. Suzyn Waldman loved it. But alas the magic was gone. He went 6-6 and lasted only 2 1/3 innings in his last ever start in the 2007 Division Series. His retirement has been one ugly scandal after another. 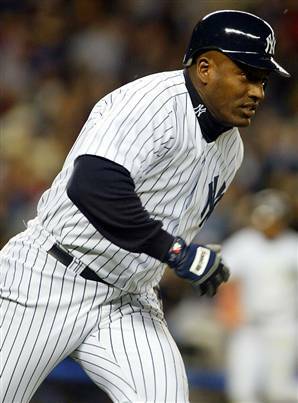 First Tour (1998-2002) The mysterious and ageless Cuban star joined the Yankees during the 1998 season. He was good in the regular season but special in the post season. 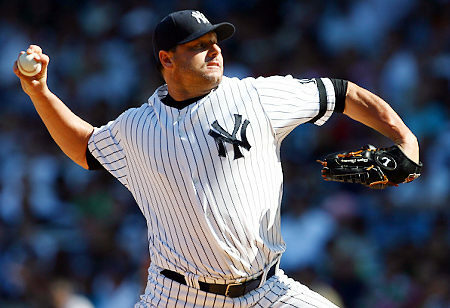 He won his first 8 post season decisions, usually posting a sub 2.00 ERA and won the 1999 ALCS MVP against the Red Sox. He would finish 9-3 over 102 post season innings with the Yankees. Second Tour (2004) El Duque was traded first to the White Sox and then the Expos but played for neither team in 2003 as injuries wiped out his season. The pitching strapped Yankees brought him back for 2004. When healthy he pitched well and Joe Torre gave him the ball for Game 4 of the ALCS. 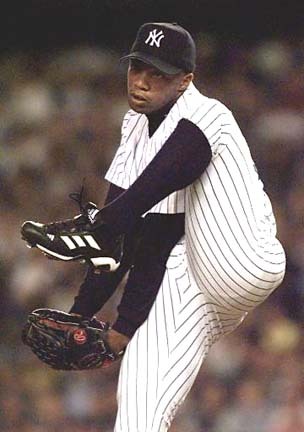 If Rivera had held onto the lead, El Duque would have been credited with the victory, no doubt adding to his legend. He joined the White Sox the next year and helped them win a World Series. First Tour (1995-2003) The 22nd round draft pick skyrocketed through the Yankees system and was one of the top rookies in 1995. By 1996 he was a Cy Young contender and won a critical World Series game when he outdueled John Smoltz 1-0 in Game 5. He piled up wins and continued to perform well in the post season, winning the 2001 ALCS MVP and winning three games in the 2003 post season after a Yankee loss. But the Yankees nickle and dimed him after the 2003 World Series and he left for Houston. Second Tour (2007-2010) After experimenting with one flop pitcher after another, the Yankees corrected their past mistake and brought Pettitte (and Clemens) back for the 2007 season. He continued to win games and log innings, even though his mediocre ERA indicated that he benefited from the Yankees explosive offense. He was so loved by the fans that even his PED use didn’t dent their affection for him. He won the 2009 World Series clincher and retired an All Star after the 2010 season. He is the best home grown Yankee starter since Ron Guidry. 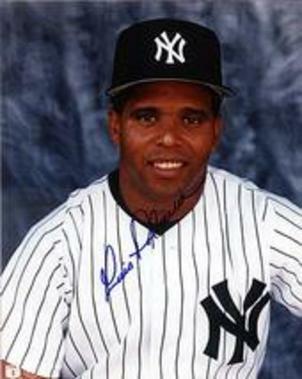 First Tour (1997-1998) Signed to replace his former Blue Jays teammate Jimmy Key, the larger than life Wells embraced the Yankees from the start and the fans loved him. And in those two years he showed he was more than a boisterous beer guzzling chicken wing eating lovable lug. He threw 5 complete game shutouts in 1998 including a perfect game. He had the best winning percentage and WHIP that year as well, finishing third in the Cy Young vote. In the post season, he went 5-0 and won the 1998 ALCS MVP. But after the season he was sent back to Toronto in the Roger Clemens trade. 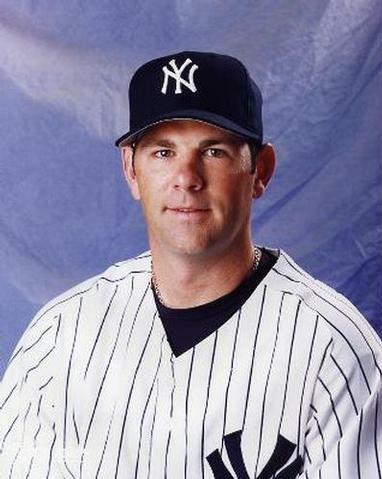 Second Tour (2002-2003) Wells returned to the Yankees for 2002 and continued to pile up wins, winning 19 in 2002 and 15 the next year. But his overgrown frat boy image was losing its charm in the dugout and he alienated himself from the team with his over the top biography published in 2003. But his biggest sin was his two post season failures. The Angels bombarded him in the clinching game of the 2002 Division Series. And his conditioning finally caught up with him when he could only throw a single inning in the critical Game 5 of the 2003 World Series. It was his last game as a member of the Yankees. First Tour (1996-1997) George Steinbrenner pulled his Father Flanagan act by bringing the Mets biggest but most troubled stars from the 1986 title over to the Bronx. Gooden’s drug problems cost him the 1995 season and his Mets career. 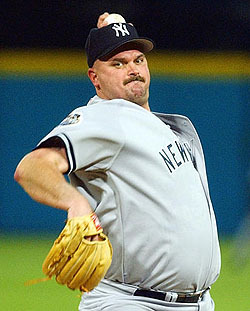 But he rebounded with the Yankees, throwing a no hitter on May 14, 1996. He started the season 10-2 but faltered down the stretch and was left off of the post season roster. He wound up going 20-12 in the two seasons in the Bronx. Second Tour (2000) After a few years in Cleveland and quick stops in Tampa Bay and Houston, Gooden returned to the Yankees and pitched well as a spot starter and middle reliever. He pitched in the playoffs for that Yankee squad and finished his career as a World Champion. Sadly his retirement has been one drug related scandal after another. First Tour (1978-1983) Gossage was already a 3 time All Star before he arrived in New York. The Yankees already had a Cy Young Award winning reliever in Sparky Lyle, but the idea of a Lyle and Gossage bullpen would make the defending World Champs unstoppable. Lyle tailed off but Gossage responded to new manager Bob Lemon and became the best reliever in the league. He closed out the Bucky Dent Game, the ALCS and the World Series to clinch the repeat. 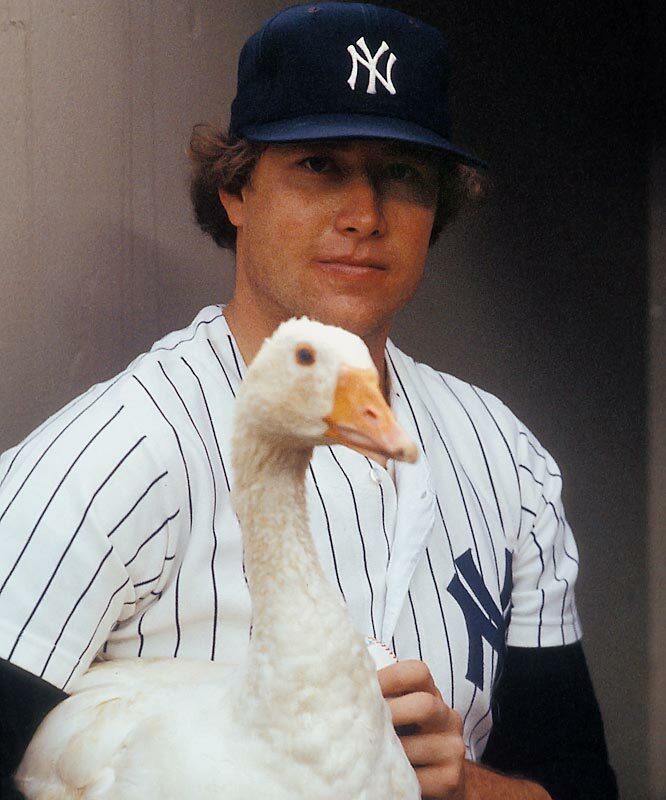 Goose had three top 5 Cy Young finishes and won the 1978 Rolaids Relief Award. He built the bulk of his Hall of Fame career in the Bronx but left for San Diego after the 1983 season. Second Tour (1989) Gossage was on the eventual National League champion Giants in 1989 and pitching rather well, but the Yankees claimed him off of Waivers. He finished the season in the Bronx with a truly mediocre Yankee squad. On August 21st, he struck out Red Sox centerfielder Ellis Burks to record his final save in a Yankee uniform. The Yankees manager? Bucky Dent. First Tour (1996-2000) Nelson came over with Tino Martinez from Seattle after Buck Showalter was not retained. He provided a reliable arm in middle relief as Torre created a bridge first to John Wetteland and later to Mariano Rivera. Nelson was an often overlooked but vital member to four World Series titles. When he returned to Seattle for the 2001 season, Torre named him to the All Star team. Second Tour (2003) The Yankees were so desperate for middle relief in 2003 that they actually traded for Armando Benitez. They needed a Jeff Nelson type and decided to go for the real McCoy, sending Benitez packing for Nelson. At age 36 his All Star stuff was no longer there. He did throw 4 shutout innings in the 2003 World Series, but he was gone the next season. First Tour (1996-2002) The ultimate Jack of All Trades pitcher, Mendoza could start, close or throw long relief. In 1998 he won 10 games and threw both a shutout and saved a game. And his durable arm was vital in the post season. He should have won the ALCS MVP in 1999 as he shut down the Red Sox in two key rallies and picked up the pennant winning save. Second Tour (2005) Mendoza played for the 2004 World Champion Red Sox and picked up his ring wearing a Sox uniform on opening day… then turned around and went back into the Yankees dugout. He recovered from shoulder surgery all year and pitched one game in September. Despite many comeback attempts, he never pitched in the big leagues again. First Tour (1997-2002) A veteran of many Bobby Cox Braves playoff teams, Stanton joined the Yankees for the World Series defense in 1997. 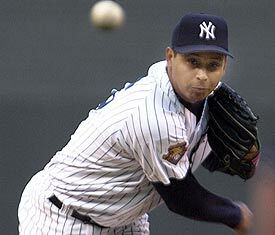 He gave Joe Torre depth in the pen and an unstoppable bridge to Mariano Rivera and made the All Star team in 2001. He wound up being the winning pitcher in two games in the 2000 World Series. Second Tour (2005) The Yankees needed bullpen depth after the 2004 ALCS collapse. They brought Stanton back to be a old reliable arm to link to Mariano. Unfortunately he was only old. His 7.07 ERA wasn’t going to cut it and was cut by July. By the end of the year, he was with the Red Sox. 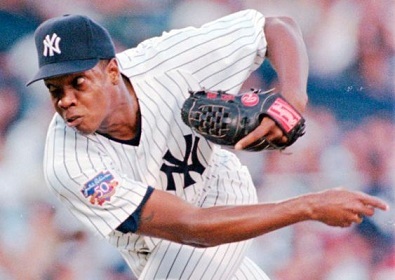 First Tour (1992-1995) Hitchcock was one of the Yankees top pitching prospects during their lean years. In 1994, his Columbus teammates included Derek Jeter, Mariano Rivera, Andy Pettitte and Jorge Posada. Who knows? 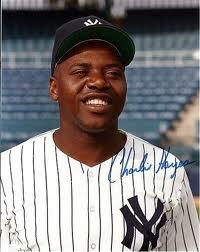 If he wasn’t included in the Tino Martinez trade, he might have been an all time beloved Yankee as well! Second Tour (2001-2003) Hitchcock was part of the 1998 Padres who were swept by the Yankees in the World Series. He returned to the Bronx in 2001 to add depth to the rotation. He was the winning pitcher out of the bullpen for Game 5 of the 2001 World Series. He was dealt to the Cardinals midway through 2003. First Tour (2004) Cairo was brought in from St. Louis to give the Yankees infield depth. He provided a surprisingly potent bat, batting .292 and only striking out 49 times in 408 plate appearances. He also got a key walk to start the Yankees come from behind rally in Game 2 of the 2004 Division Series. Second Tour (2006-2007) Cairo spent 2005 with the Mets and came back to the Yankees for 2006. There was no pop in his bat this time. He was let go by the Yankees midway through the 2007 season. 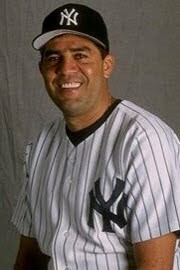 First Tour (1997) When Luis Sojo couldn’t play second base during the stretch of 1997, the Yankees dealt with the Cubs for Sanchez. He responded by batting .312 and helping the Yankees get back into the post season. In the off season, the Yankees dealt for Chuck Knoblauch and made Sanchez expendable. Second Tour (2005) In the wake of the 2004 collapse, the Yankees assembled a strange combination of former Yankees and players who had once beaten the Yankees. Sanchez returned but was not a factor in his 23 games. First Tour (1989-1990) The Yankees dealt Rickey Henderson back to the A’s back when New York had the crappy team and Oakland had the juggernaut. The Yankees were thinking long term and Polonia was the spark plug for the future. That is until they dealt him a year later for veteran Claudell Washington. Second Tour (1994-1995) OK… We’re serious. THIS time, the Yankees were going to have Polonia be their long term solution in the outfield. A commitment that lasted a year and a half. Third Tour (2000) The Tigers cut Polonia who was an awful defensive outfielder and got caught stealing a lot. So naturally the Yankees brought him back to be a defensive replacement and pinch runner. This time he played for a World Champion. He made his final big league appearance in the 2000 World Series. Second Tour (2003-2005) Sierra returned to the Yankees as a humble former star who realized he may have squandered a Hall of Fame career. He mended his fences with Torre and became a stable veteran in the clubhouse and a productive part time player. He hit a dramatic 3 run game tying home run in the 8th inning of Game 4 of the 2004 Division Series that set up the extra innings clincher. First Tour (1980-1984) The Yankees dealt Chris Chambliss to Toronto for Cerone, a New Jersey native and Seton Hall Graduate. 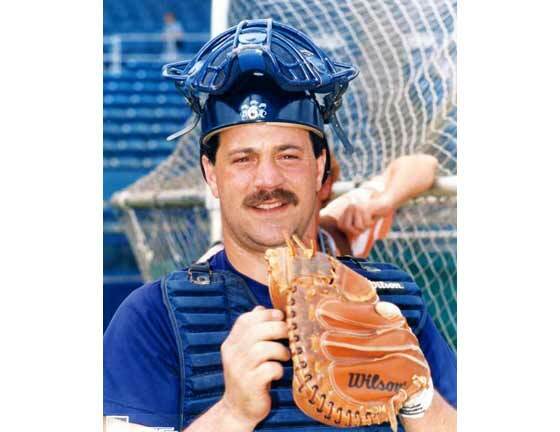 He had the impossible task of becoming the Yankees full time catcher after the death of Thurman Munson. He did well his first season, playing in 147 games and finishing 7th in the MVP vote. He would pass the 100 game mark as a Yankee only one more time as the team went on to employ a Merry Go Round of part time catchers. Second Tour (1987) The Yankees catching situation was a mess in 1986. Butch Wynegar, Ron Hassey, Joel Skinner and Juan Espino all split time behind the plate. Manager Lou Piniella had played with Cerone and brought him back for 1987. He started 86 games behind the plate and even pitched 2 innings. Third Tour (1990) Bucky Dent, another former teammate turned manager, brought Cerone back in 1990, presumably to mentor the young and inept Yankees. If he provided any leadership, it wasn’t reflected in the standings. The Yankees lost 95 games and he only played in 49 of them. To be fair, he hit .302 as a part time player that year. After his retirement, he was one of the founders of the independent Newark Bears. First Tour (1979-1982) By 1979, John was already a Cy Young contender and a pioneer in receiving the experimental surgery that bears his name. The Yankees signed him as a free agent before the 1979 season and he continued his winning ways in the Bronx. 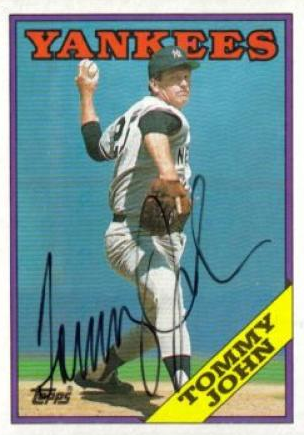 He won 21 games in 1979 was the Cy Young runner up. He won 22 in 1980 and led the league in shutouts. He was traded back to Southern California when the Yankees and Angels worked out a deal during the 1982 season. Second Tour (1986-1989) With the Yankees desperately in need for young pitchers, they brought back the 43 year old John in 1986. In 1987 he had his last solid year, logging 13 wins and throwing 187 2/3 innings. In his final season, he was teammates with many players who weren’t born when he made his big league debut. So when people call the Yankees “The Evil Empire” don’t believe it! They are a gooey and sentimental.